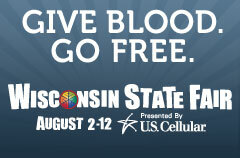 The Blood Center of Wisconsin has two great promos going on right now in an effort to increase blood donations. Both of them include getting in free to an event - Wisconsin State Fair or a Brewer's game. If you donate blood at one of our donor centers now through August 11, you’ll give the gift of life to up to three people. And as a special thank you for donating during this time of high need, you’ll score a free one-day admission to the State Fair — one of the most family-friendly and affordable entertainment experiences of Wisconsin’s summer season. Call 1-877-BE-A-HERO (1-877-232-4376) or 1-414-937-6199 to make an appointment. Be sure to mention "Summer" to get your free ticket. Or make an appointment online at one of their donor centers. Type "Summer" in the comment box on the confirmation page during your online registration. In addition to the Wisconsin State Fair ticket, you'll also receive an extra 200 recognition points in our Giving for Life program for your summer donation. It's another way to thank you for your life-saving contribution. If you have questions, or would like more information about the Giving for Life program, call 1-877-BE-A-HERO (1-877-232-4376) or 414-937-6199. In baseball, you have to be a closer to get a save. But most of us can get a save without ever pitching a ball – by giving blood at the 11th Annual Big League Blood Drive! Join us Tuesday, August 28 & Thursday, August 30 as we partner with the Crew to save lives in our community. Call 1-877-BE-A-HERO (1-877-232-4376) or 1-414-937-6199 to make an appointment or make an appointment online.